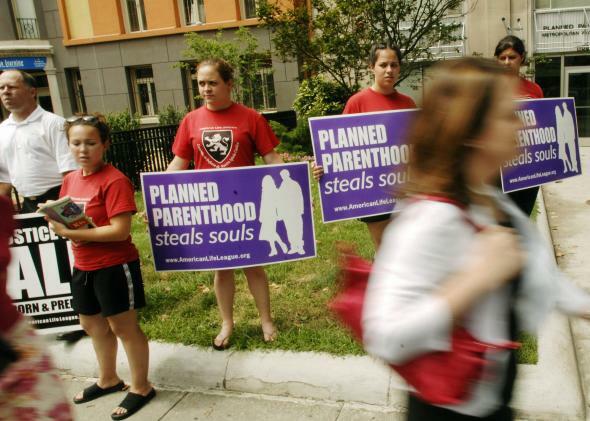 Abortion clinic offers patients tea and fluffy robes: What's the problem? The shaming brigade outside a Planned Parenthood in Washington in 2005. You can already hear the who-do-they-think-they-are responses being typed out on social media, but why shouldn’t a health clinic aim for a more welcoming experience? I know I appreciate, for instance, having a DVD player on hand during a root canal. Well, cancer isn’t pleasant, either, but that’s not a reason to deny cancer patients fluffy robes and soothing music. Getting medical treatments in general is unpleasant. That’s exactly why health care providers should try to smooth the edges as much as possible with creature comforts. The same should go for abortion, a really common procedure that a woman runs a 1-in-3 chance of needing at some point in her life. Abortion is legal. If you want a little more misery and shame with your abortion experience, feel free to impose that on yourself, but for those who disagree, pass the fluffy robes and the herbal teas. Correction, March 31, 2015: Due to an editing error, the headline of this post originally stated that the clinic is located in Washington, D.C. It is located in Maryland.